25cm; 55-84g. 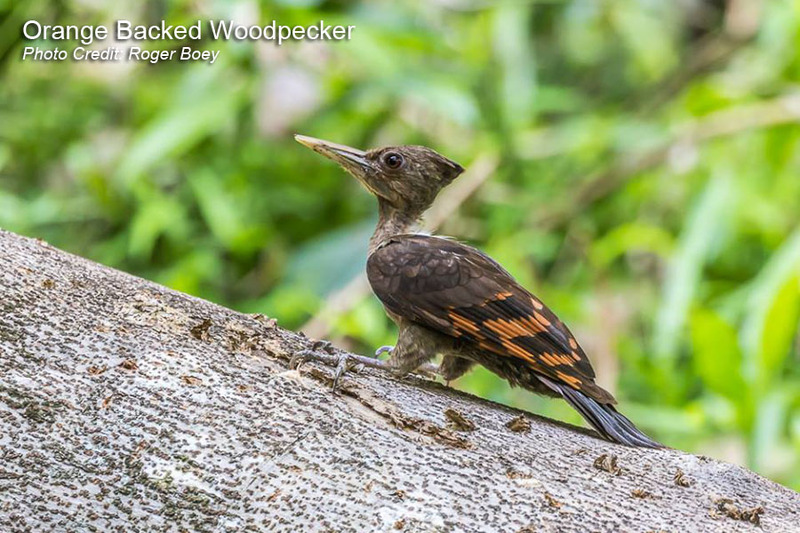 This medium-sized woodpecker has a short crest and a short slightly curved black bill. Overall plumage is rufous but male has speckled throat and small red patch on face. 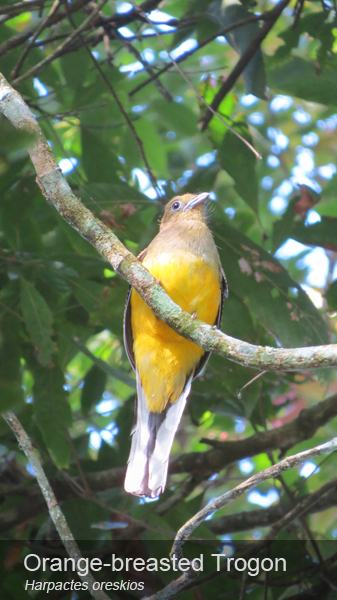 Female may look similar to male but lacks the red patch. 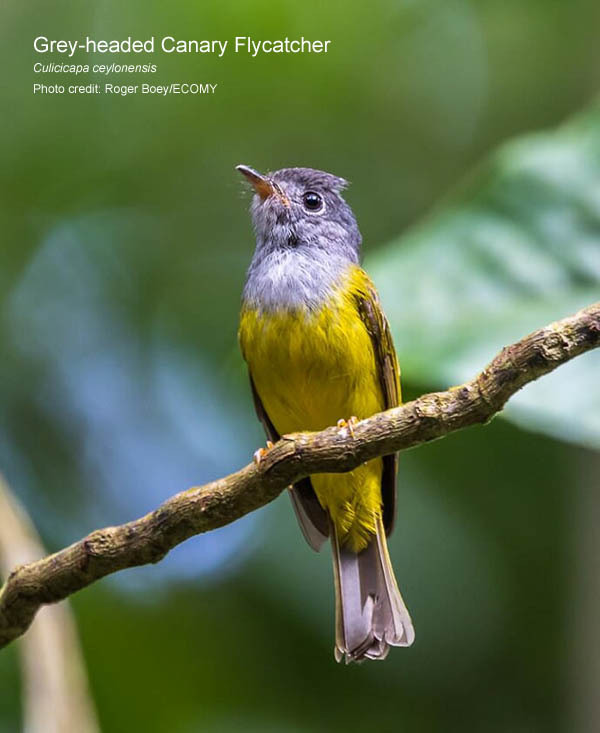 It is very vocal with a series of “keenk” notes and can be heard in primary forest, secondary forest and even public parks. It feeds mainly on ants. 24-28.5cm; 140g. The adult bird is blackish brown with pinkish broad bill. There is a noticeable small white patch on the wings. The call consists of 6-8 screaming notes. 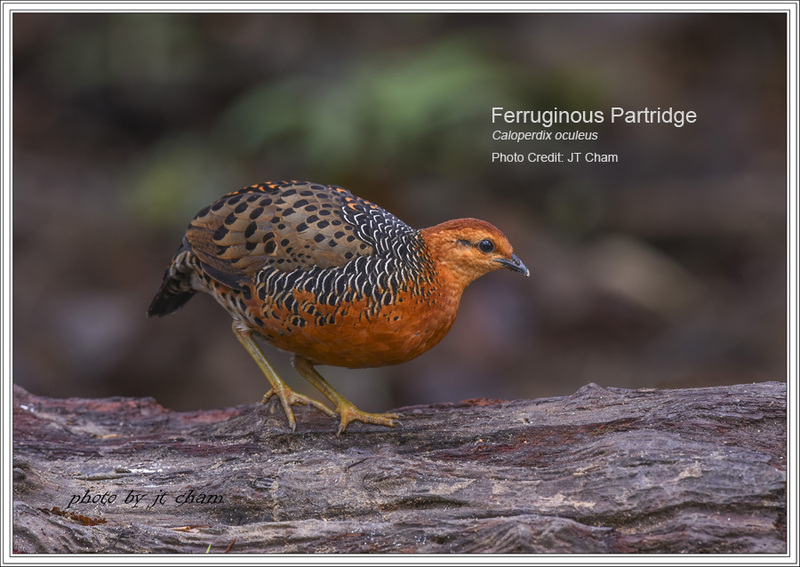 Found and seen in small flocks from lowland forest and up to highland forest of over 1,200m. Mainly insectivorous. 11.7-15cm; 4.8-9g. 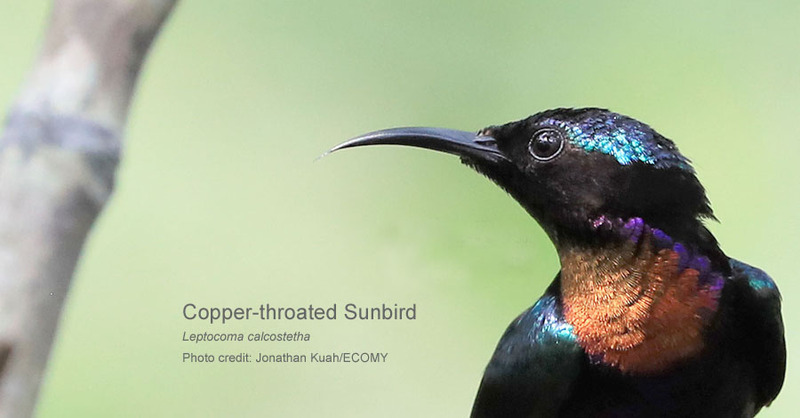 This Sunbird is found singly or pair in mangroves, secondary forest and flowering gardens. 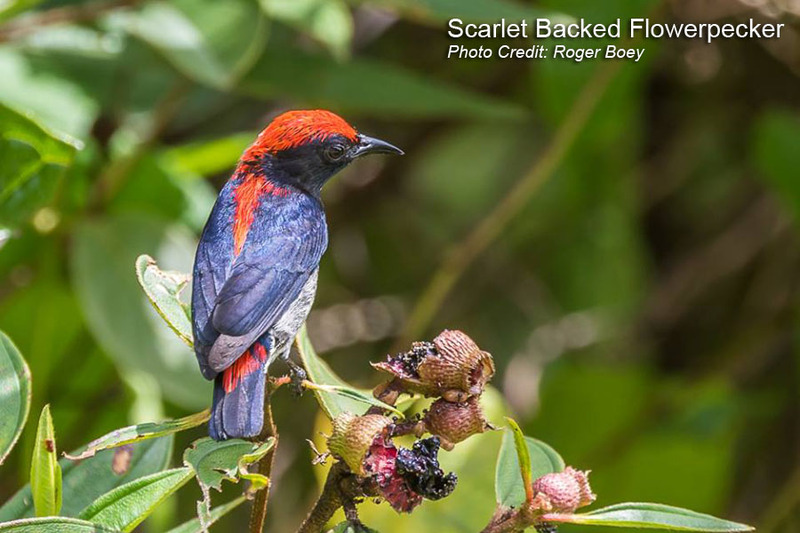 The down-curved bill allow them to feed on nectar and insects, especially spiders. Calls are rapid, sharp and high-pitched. The head of the male is red with dark greenish blue crown. 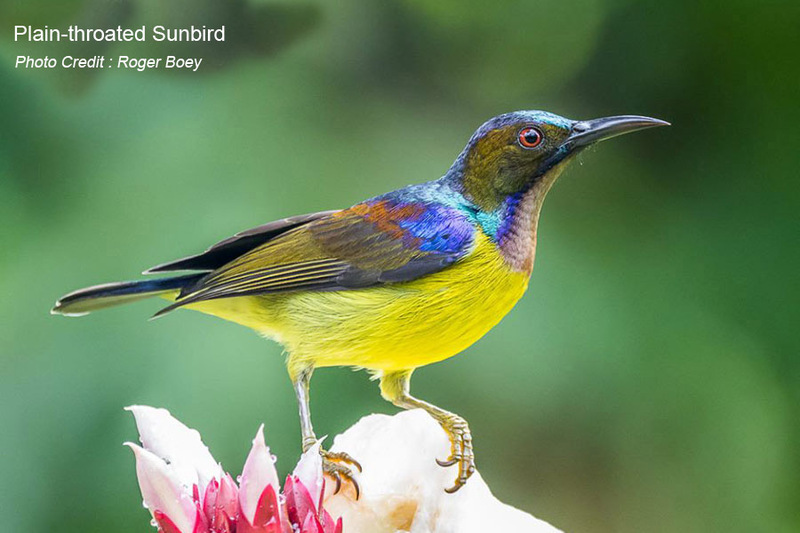 Female is very dull compared to female of other species of Sunbird. 40-53cm; 455-680g. 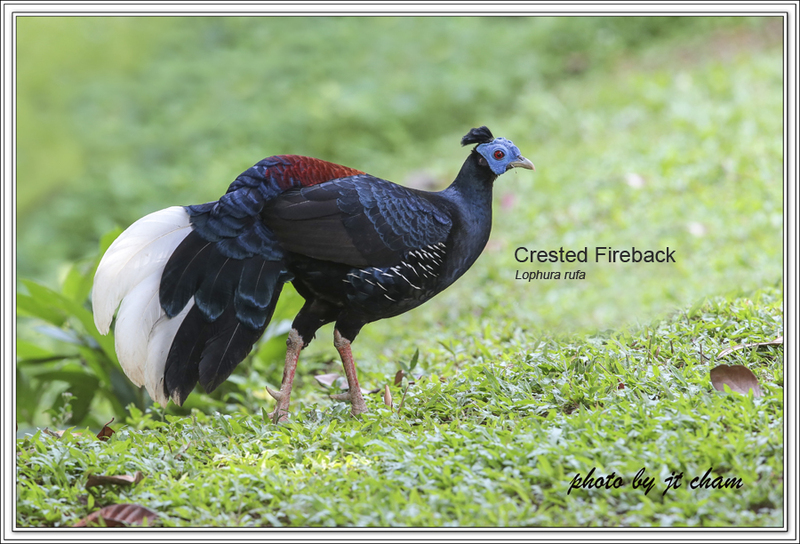 Considered as an endemic to Malay peninsula, this species is relatively smaller than Mountain Peacock-pheasant. It is light brown above and orange face skin. Male has a pointed crested, greenish blue ocelli on the wings and tail feathers. 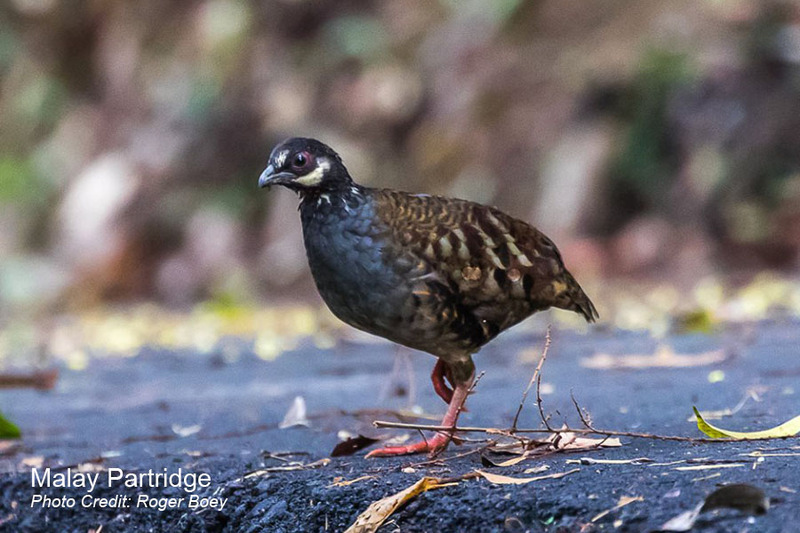 Similar to some other species, the male has spurs on the legs which is probably used for fighting between males. Female lacks obvious crest and less distinct ocelli. Its harsh explosive call is regularly heard in the lowland forest of Taman Negara. Regularly seen feeding on grubs and other insects, but it could probably feeding on fruits too. 46-65cm. 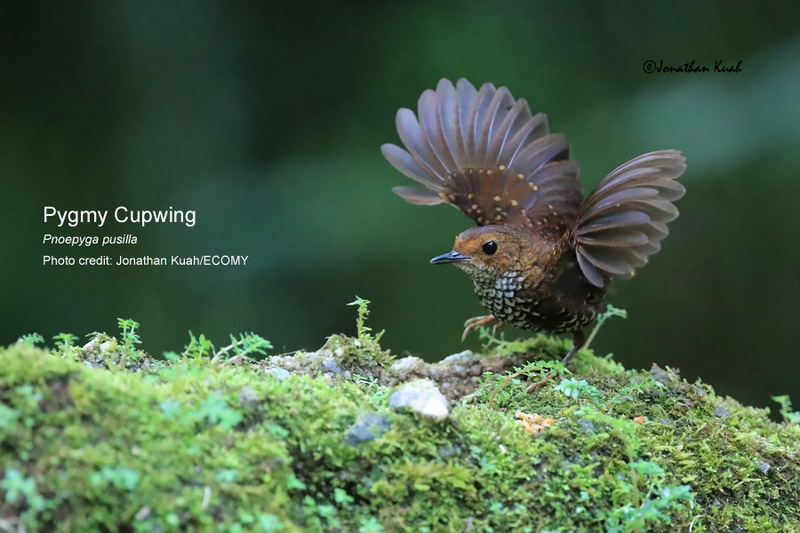 This elusive bird is considered endemic to the highlands in central Peninsular Malaysia. 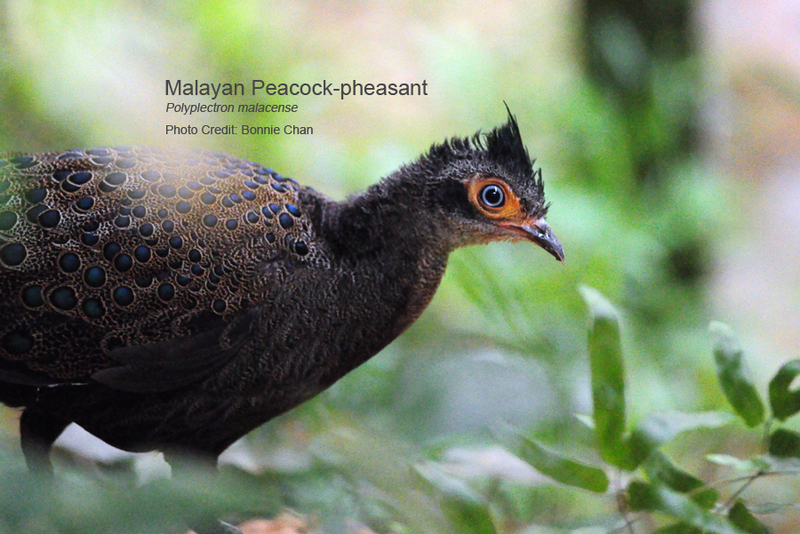 It lacks an obvious crest making it easier to differentiate with a Malayan Peacock-pheasant. 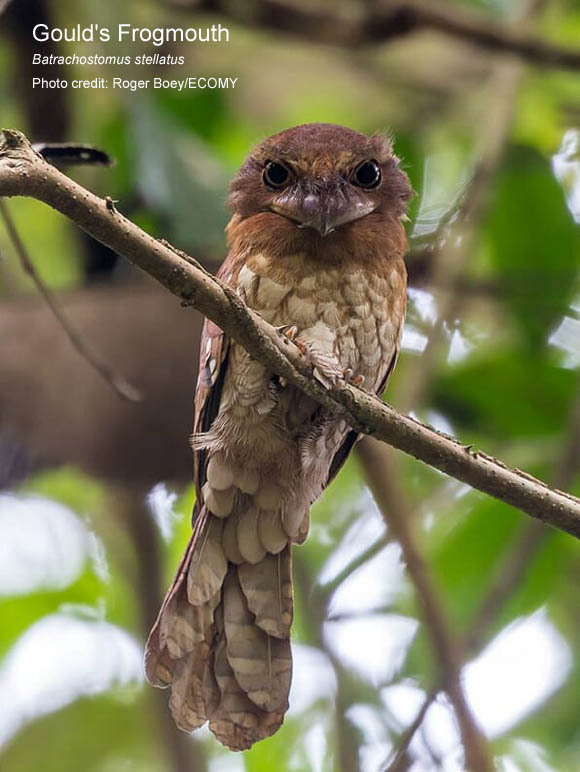 This species is chestnut brown above with small ocelli and dark greyish below. Whitish speckles on neck and head. Male has blue ocelli and 2 spurs on legs while female has black ocelli without any spur on legs. Sometimes 1-4 clucks heard but generally less vocal. 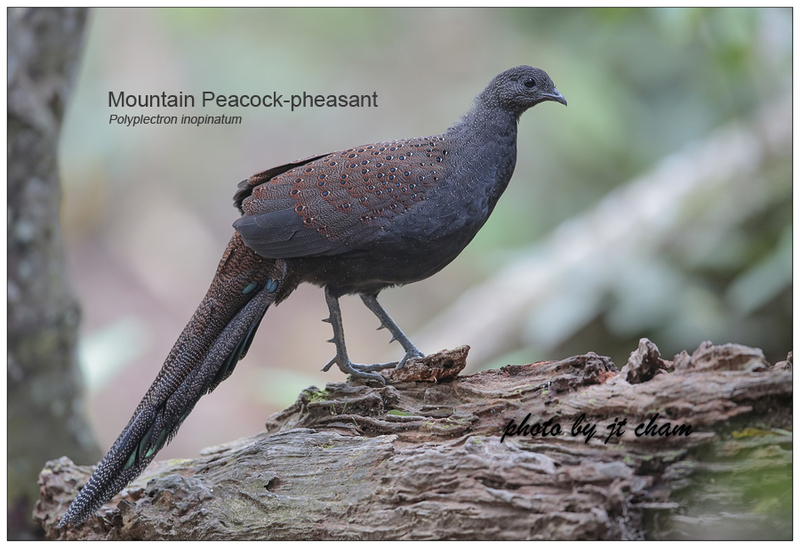 Mountain Peacock-pheasant feeds mainly on ants, grubs, beetles, spiders and berries. 25-31cm; 49 – 57g. This species is sexually dimorphic. Male is more attractive than the female which appears to be duller. 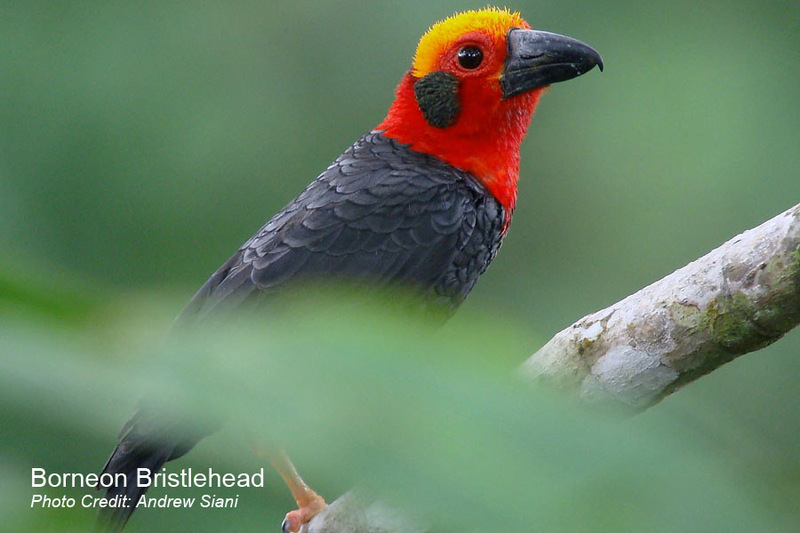 The head of the male is greenish-olive while its underpart is yellowish-orange. Male will utter It inhabits the middle storey and lower canopy of forest trees. It feeds on cicadas, beetles, ants, stick insects and caterpillars. 21.5-23cm; 74.7-87.5g. 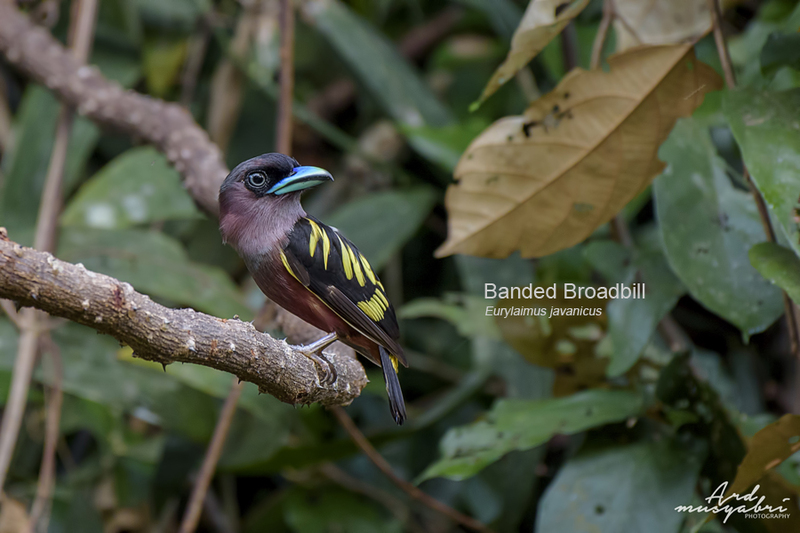 Banded Broadbill is considered a large broadbill with purple, yellow and black plumage. It prefers the forests including logged forest but will also forage at the edges of forest and open areas. This species is generally feeds on insects such as grasshoppers, crickets, beetles, and katydids. 25-28cm. It has a red crown, red submoustachial and barring below. 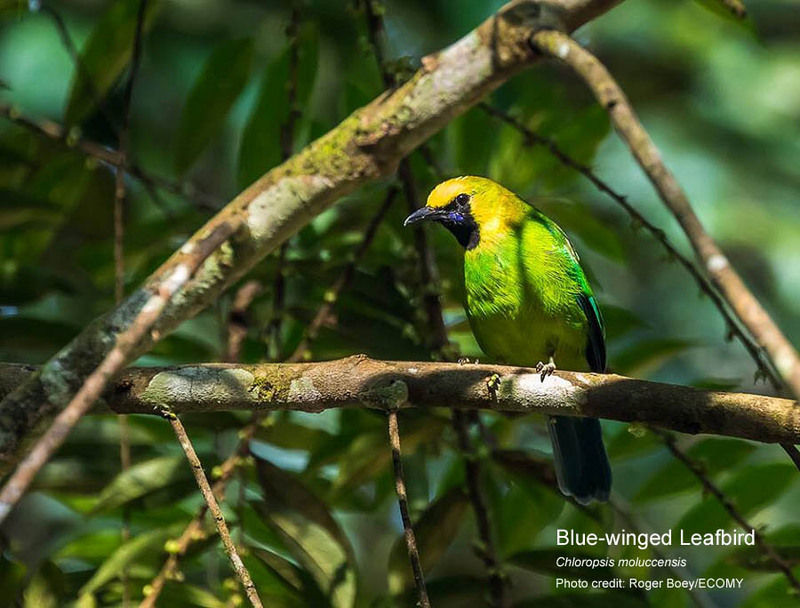 The sub species in Peninsular Malaysia can be found above 1,065m, therefore you will need to go up to places like Fraser’s Hill to see it. Its call is a loud “pée-a” or “péee-ui”, also short “chak”. 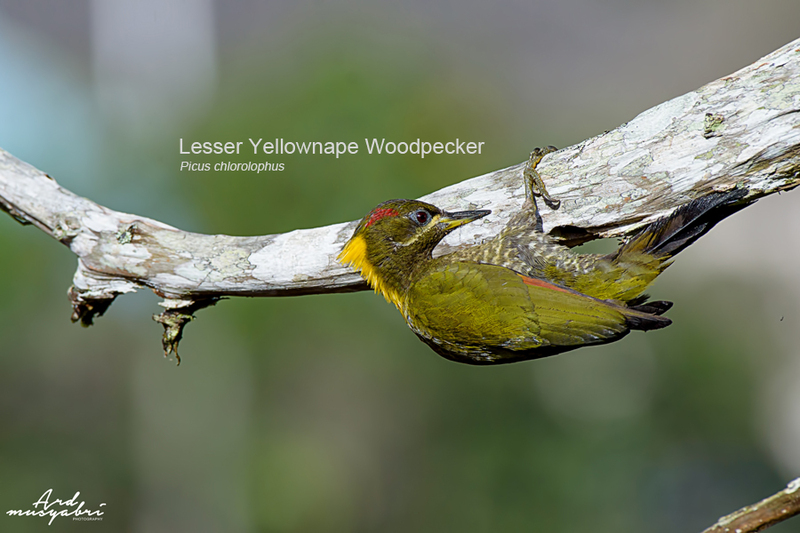 Lesser Yellownape is able to capture beetles and other insect larvae with its long tongue. 20-26cm; 54 – 110g. 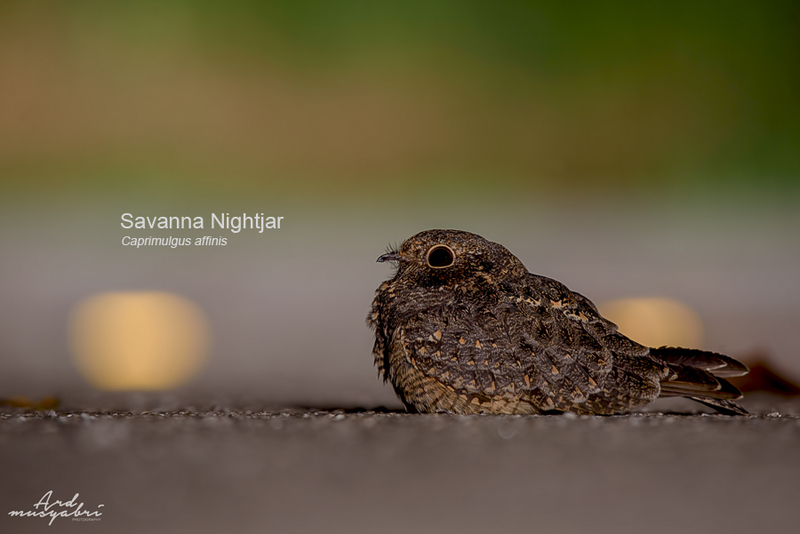 A small nightjar generally brown and has short tail. Male has white wing patches and white outer tail feathers while female has smaller wing patches. Usually active just after dusk with its repetitive inflight call “chweep”. It can be seen mainly in grassland and often high above ground hawking for moths, beetles and termites. 44-48cm; 1011g. Relatively small with short wings and short tail. Male is slaty blue above while its neck and upper chest are bluish-grey. Female is brown above. The song is melodious but ends rather chaotically. It prefers staying in dense, dark and damp undergrowth. Mainly feeds on insects, grubs and beetle pupae. 44-48cm; 1011g. 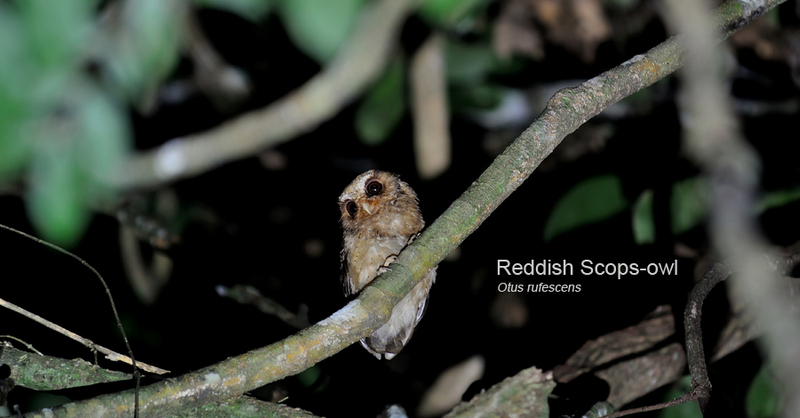 This nocturnal owl has rusty (orange-buff) facial disc. Generally brown upperpart with white spots while underpart has narrow black and broad white barring. Spotted Wood Owl can be heard calling with a series of rolling deep “whowhowhowhowho” or “huhuhuhuhu” at dusk and dawn. It prefers forest edge, trees near human settlement, orchards and plantations from coastal area up to 1000m. They feed mostly on small rodents, small birds (such as Eurasian Tree Sparrow) and large insects. 15-17cm; 16-31g. 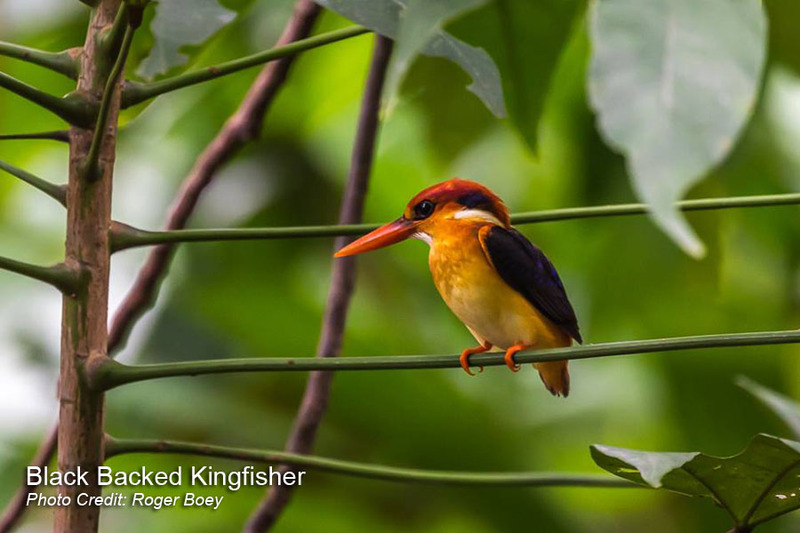 Blue-eared Kingfisher has blue head, white on the side of the neck and rufous underpart. Male has completely black bill while female has pinkish lower mandible. 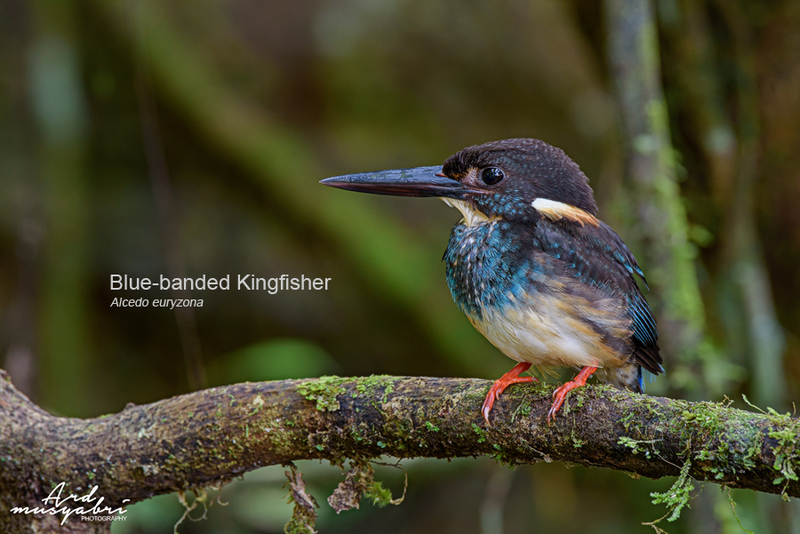 Its single high-pitched call “trreee-tee” or “tiiet” is similar to Common Kingfisher, probably little sharper. This species is mainly found along rivers and streams in the forest but sightings are possible near urban areas. 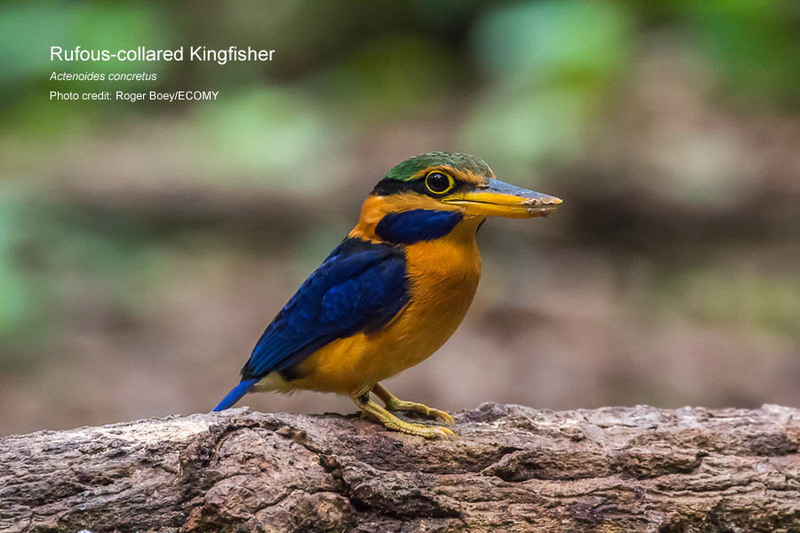 While hunting or searching for food, this kingfisher will perch above water with head boobing before it dives into the water to catch its prey. Its diet consists of fish, crustaceans, and insects. 15-18cm; 70-83g. This relatively small sized owl has ear tufts, yellowish pink bill and its forehead as well as eyebrows are buffy to white. 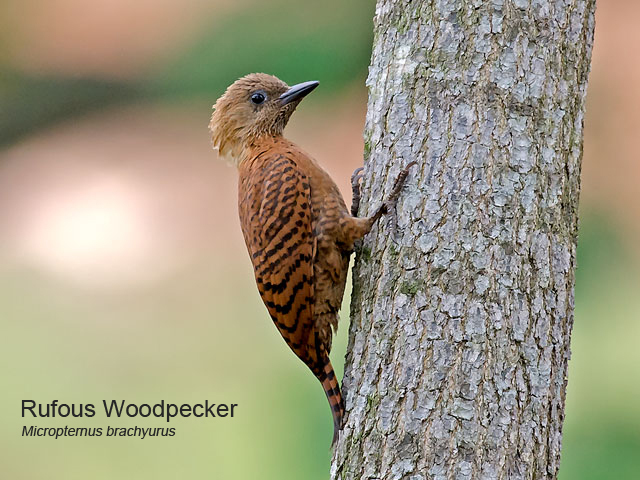 Upper plumage is rufous / cinnamon brown while underpart is paler with dark spots. 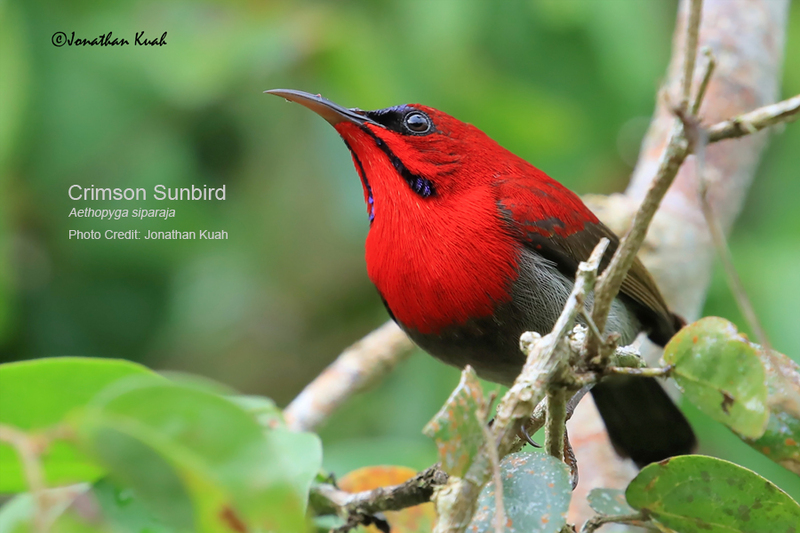 Although it is rarely seen and photograph, it can probably be considered common in few localities in the country, especially Taman Negara. Listen to its hollow whistle “hoooo” repeated between 7-11 seconds at night to locate the owl. 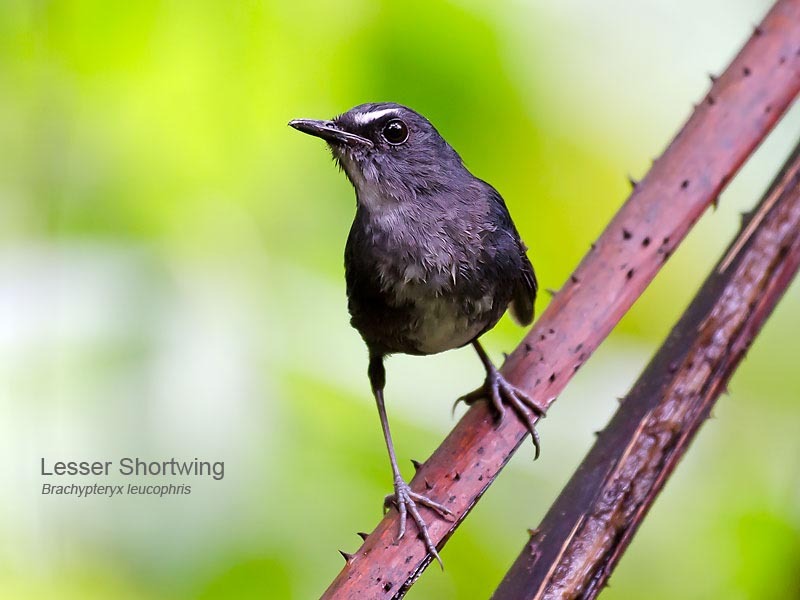 This species occurs in the lowland forest up to elevation of 1000m above sea level. There is little information on its feeding habit but grasshoppers and crickets were found inside dead specimens. 28-30cm; 66-72g. Highly unmistakeable. This unique bird has long neck, long tail and broad white supercilium. 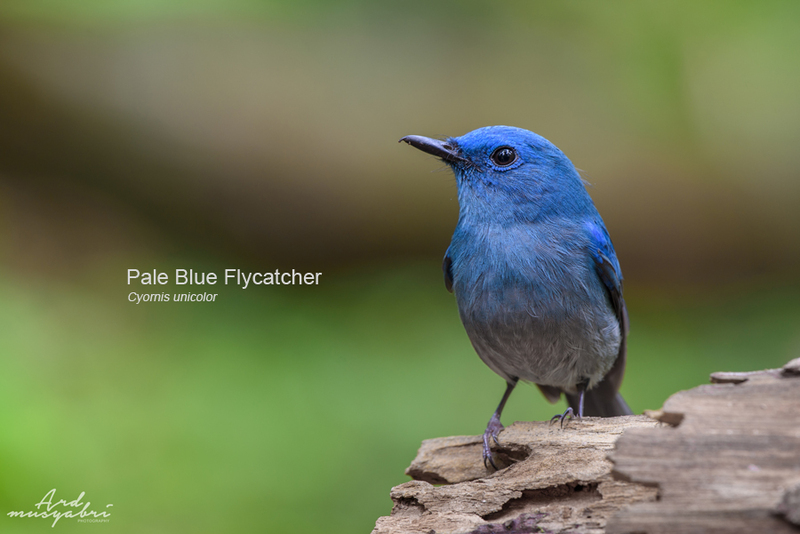 During vocalisation, it raises the tail, lower its body and inflate its blue throat patches. Soft cluckings can be heard at close range too. It lives on forest floor of lowland forest as well as hill forest and feeds on insects such as cicadas, beetles and spiders. 12·2–13 cm. 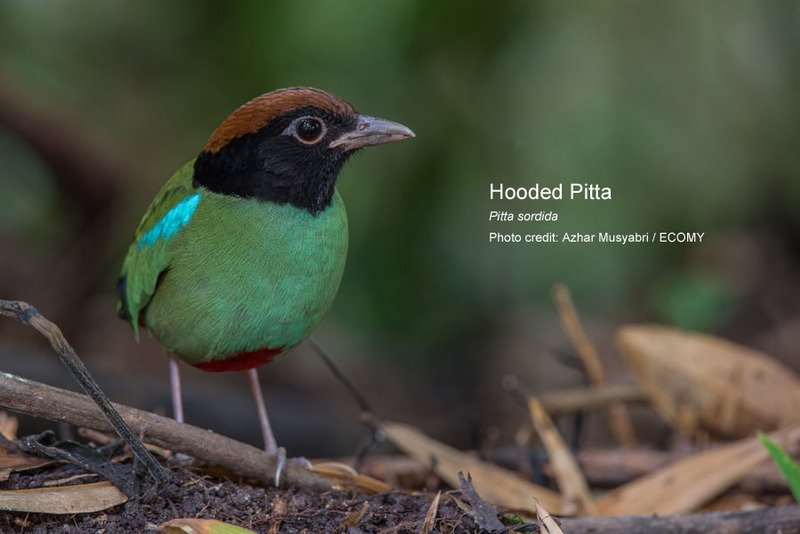 Male has top of head metallic green, sides of head, hindneck, upper back, wing and tail black, lower back, rump and upperwing-coverts green, and obviously copper-red throat. Female has greyish head, white throat and white outer tail tip. Utters both a high trill, and a deep melodious trill. This species inhabits mangroves, heath forest, ­alluvial forest, and secondary forest. It feeds on nectar of Bruguiera trees and small arthropods. It is always seen actively foraging in lower and middle storeys. 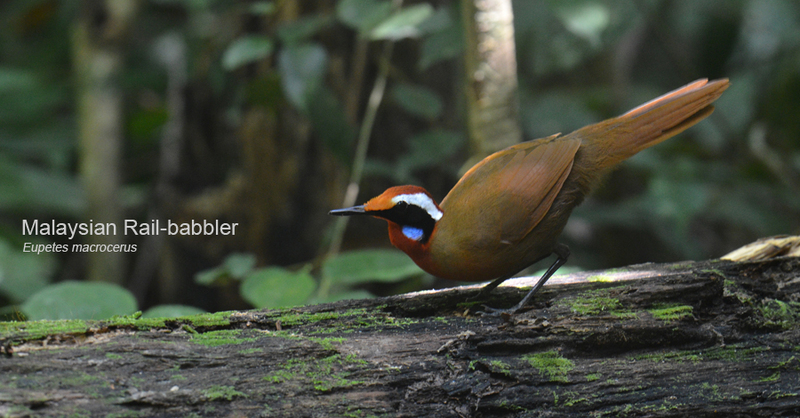 7·5–9 cm; 11–15 g. Tiny, almost tailless olive-backed babbler with pale scaling below. Song is unmistakable, very high-pitched, well-spaced, piercing “ti-tu” or “ti-ti-tu”. It prefers the understorey of broadleaf evergreen forest, densely vegetated forest ravines and mossy habitat. 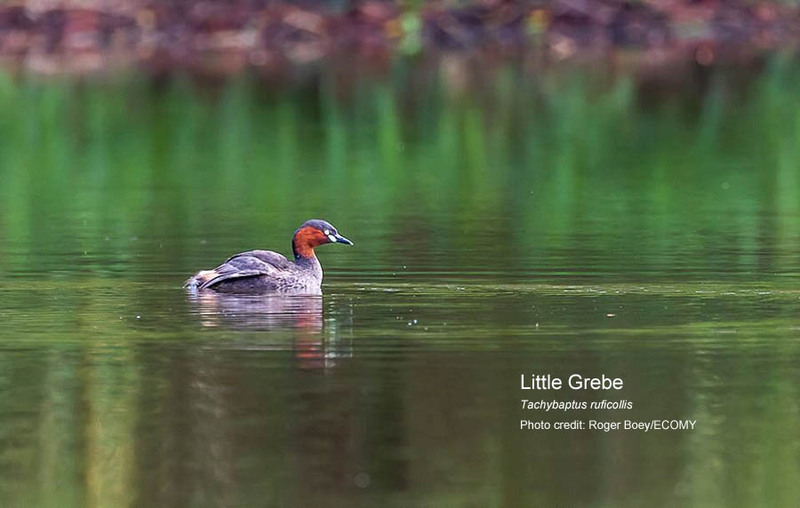 This tiny bird forages on the ground to catch ants (Formicidae) and other small insects as well as spiders (Araneae), snails and grubs. 21–25 cm; 47–48·5 g. Occurs in two colour morphs. Adult has narrow whitish collar across mantle, bold whitish spots on wing-coverts and scaled underparts. Song is an eerie “wooah-weo”, with first note drawn-out and second descending. Found in the dense forest, sometimes secondary forest and prefers lower storey. Diet known to include Orthoptera such as grasshoppers and crickets, and also moths (Lepidoptera) and beetles (Coleoptera). 25–29 cm; 130–236 g. Small and dumpy, the rump often appearing very fluffy. 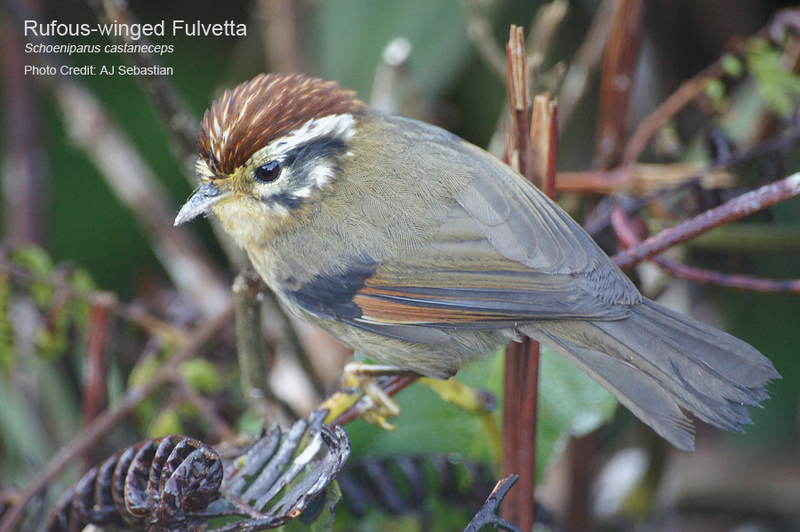 During breeding, blackish-brown cap down to just behind eye and to chin, yellow eyes and dark bill with prominent yellowish gape. Loud, fast trill given by both sexes. Found in a wide range of wetlands, normally small and shallow, including small lakes, ponds, and canals. Mainly insects and larvae feeder, consisting of mayflies (Ephemeroptera), stoneflies (Plecoptera), various water bugs (Heteroptera), beetles (Coleoptera) and others. 18–20 cm; 27 g. Long, deeply forked but evenly graduated tail with white tips, two outer feathers entirely white. 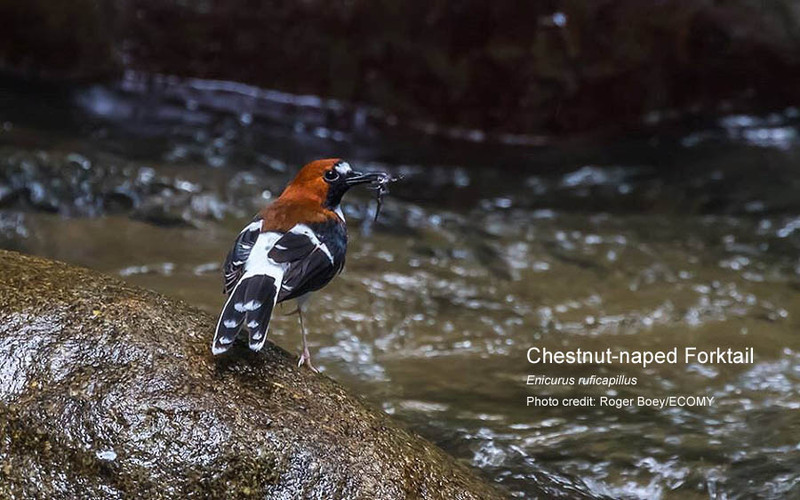 Male has rich chestnut crown to nape while female has chestnut crown, nape and back. Both has scaled white breast. Call, in low flight, a penetrating whistle or three loud whistles with middle note higher. Found along small clear shady rivers, streams and waterfalls in the forest. Diets consist of terrestrial invertebrates including beetles, larvae, ants and other insects. 15·8–17·7 cm; male 20–28·5 g, female 19–25 g. Male has black mask from lores to throat. Song of various musical, liquid notes “pli-pli-chu-chu” and “chi-chi-pli-i”. It usually stays high in the canopy and edge of forests. Varied diet which includes arthropods, fruits, probably also nectar. 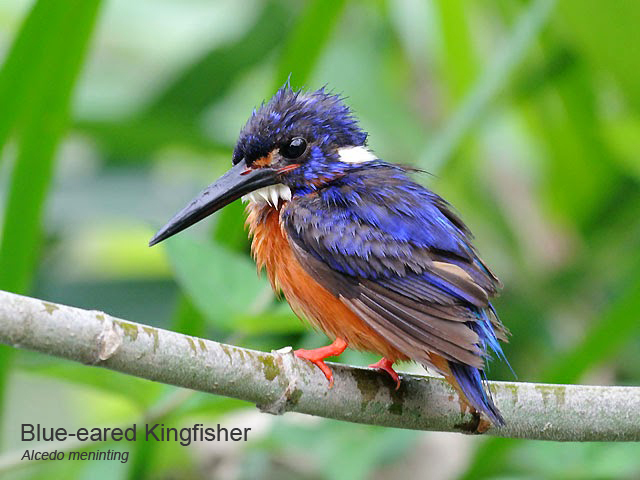 23–25 cm; male 62–89 g, female 60–90 g. Solid, medium-sized kingfisher. Male nominate race green cap, light blue hindcrown, black eyeband and rufous collar and breast. Female has buffy speckled coverts. Call soft to loud, rising, repeated whistle, “kwee-i”, at rate of 1 per second. It inhabits Evergreen to semi-evergreen dense lowland forest, also forest regenerated to closed-canopy stage, near water, up to 1,200m asl. Among its main diet includes invertebrates such as Isopoda, cicadas (Cicadidae), longicorn beetles (Cerambycidae), mantises (Mantodea), spiders, and scorpions. 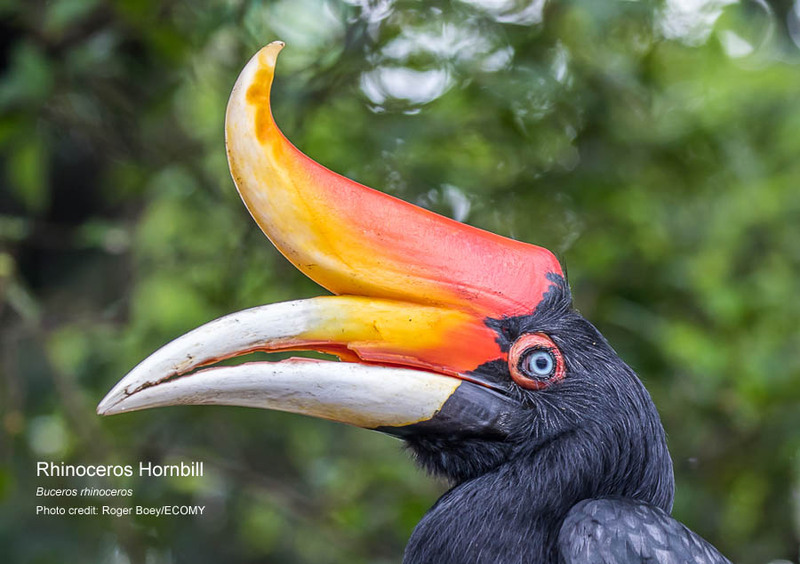 80–90 cm; male 2465–2960 g, female 2040–2330 g. Large mainly black hornbill with white thighs and vent, black band across white tail; bill mostly pale yellowish to whitish while its upward curved casque is red and yellow. Male has reddish eyes with black eyering while female has whitish eyes with red eyering. A series of short, explosive, resonant “rroh” calls. 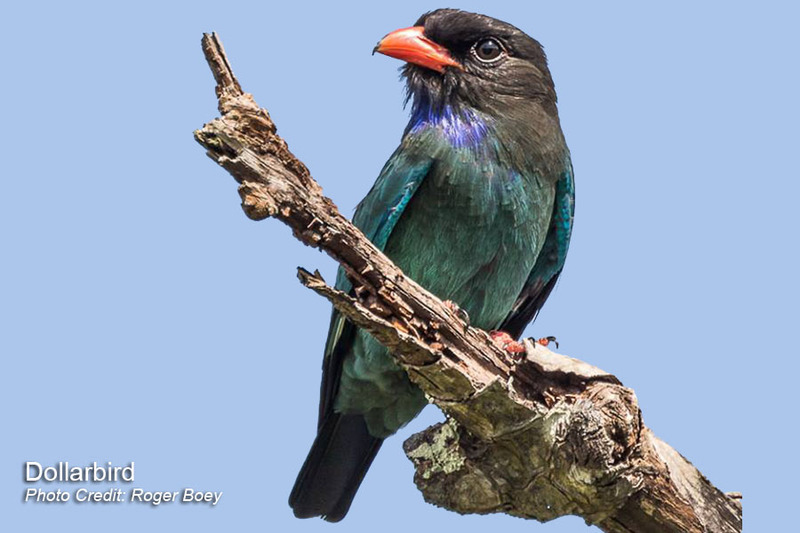 Pairs also call antiphonally or simultaneously when flying with a loud ger-ronk. Usually found in pairs in extensive areas of primary evergreen forest, extending into tall secondary forest. Feeds mainly on fruits, especially figs, but also various lipid-rich capsules and drupes; in addition, eats any small animals it can catch. 22–26 cm; 115–150 g. Heavy-bodied passerine with massive hooked bill and short tail, giving top-heavy appearance, and long powerful wings. Male has unfeathered heads. Calls frequently, with variety of snorts and whistles. Forest. Often said to favour peatswamp-forest, but is probably most commonly associated with lowland and hill primary forests. Major food items include katydids (Tettigoniidae), cicadas (Cicadoidea), stick-insects (Phasmida), beetles (Coleoptera), caterpillars etc..
Taxonomy: Arboroicola campbelli borders of Perak and Penang, Malay Peninsula. Until recently considered conspecific with A. rolli, A. sumatrana and A. orientalis (which see). Sometimes also considered conspecific with A. javanicaand A. brunneopectus, but morphological similarities normally attributed to convergent evolution. Monotypic. Distribution: Mountains of Peninsular Malaysia. Description: 30 cm; 155–185 g. Male has red forehead, crown and short crest bordered pale orange, orange-brown side of head, darker and browner towards rear; chin and malar area. Voice: Various loud, ringing calls, e.g. “pit”, singly or in loose irregular series. Habitat: Primary or secondary evergreen rainforest, coastal vegetation, mature plantations. 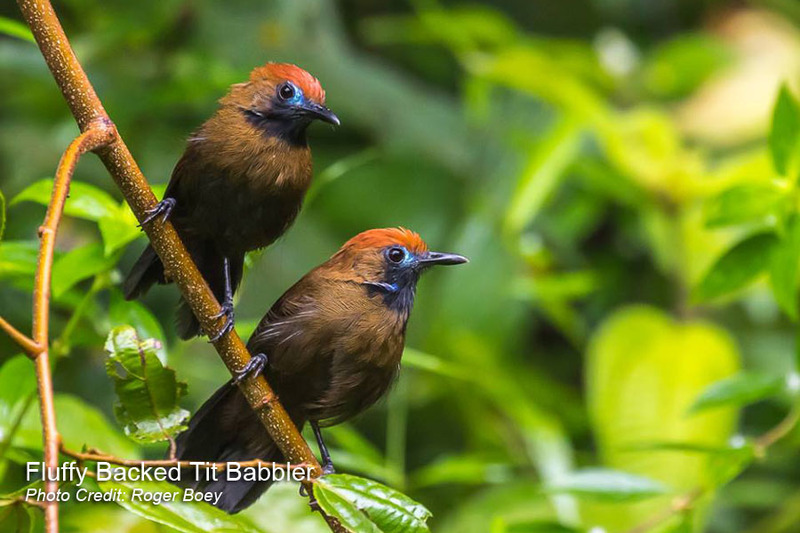 Description: 7–9 cm; male 5·5–8 g, one female 6 g. Male nominate race has crown to back and rump deep red, side of head black, upperwing and tail glossy blue-black. Voice: Call “chip-chip”, sometimes repeated; also a loud, staccato, clicking “tchik-tchik”.. 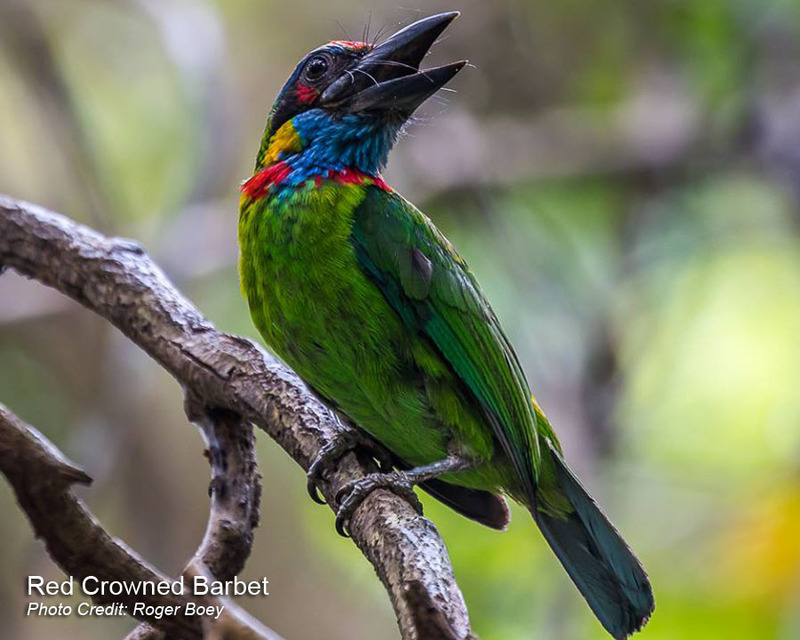 Description: 26 cm; 99–150 g. Large, chunky green barbet. 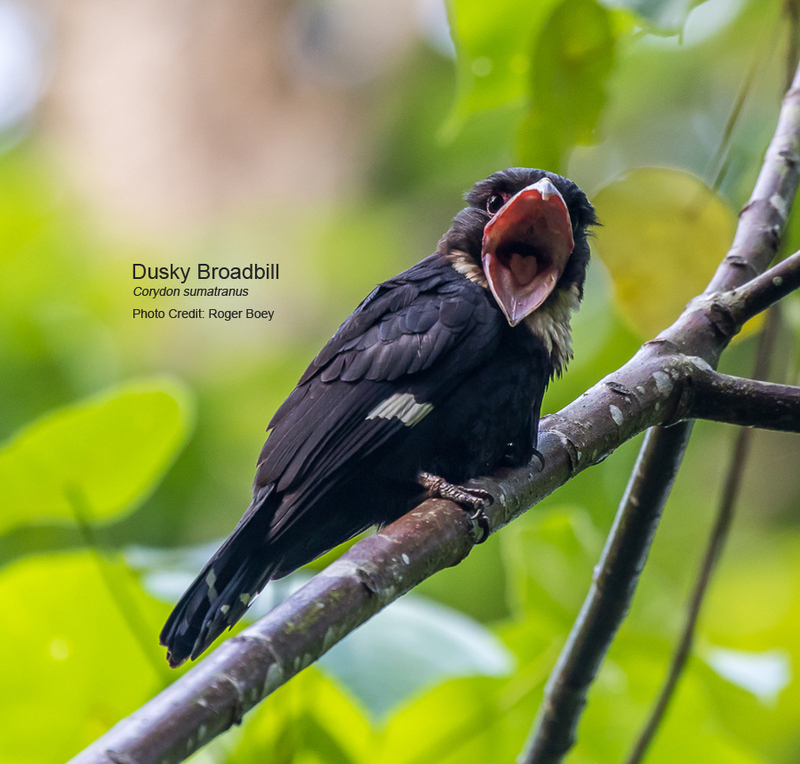 Both sexes have red crown, red spot below eye, red mark on side of neck, black and yellow face, as well as blue throat..
Voice: Song starts with low “took” notes at 1 per second, leading to “tuk” notes. 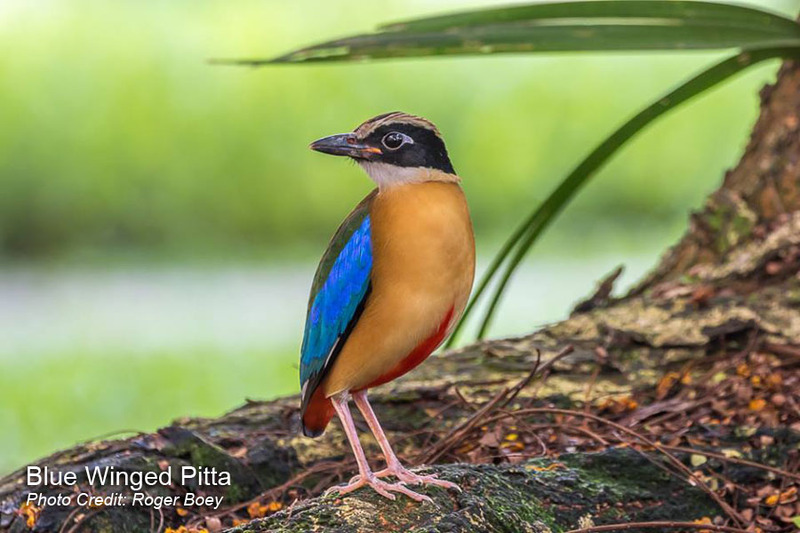 Description: 18–20 cm; 54–146 g. Adult has blackish head with broad buffy brown sides of crown and buffy supercilium; upperparts dark green, rump turquoise-blue, tail black. Voice: Loud clear “taew-laew”, second note stressed, usually doubled as “taelaew-taelaew. Habitat: Found in variety of habitats, from moist or dry primary forest with dense or sparse undergrowth. Diet includes many kinds of insects etc. Description: 12·5–14 cm; male 14–21·5 g, female 14–16 g. Both sexes of nominate race have black spot on forehead, blue and white patch on side of neck. Voice: High-pitched “tsriet-tsriet” or soft “tjie-tjie-tjie” in flight. Habitat: Deciduous and evergreen primary and secondary forest, alluvial forest, mangroves, overgrown rubber estates. Description: 12 cm; male 11·2 g, female 11·6 g. Male has crown to mantle dark metallic green, maroon band across upper back, rest of back, rump and uppertail-coverts violet. Voice: Various chirps and metallic trills; song a high “sit-sit-sit-see”. Description: t27–32 cm; male 109–175 g and female 117–186 g (orientalis, pacificus, solomonensis), male 165–214 g and female 164–..
Voice: Typically rather silent. Commonest call is a repeated short, hoarse, rasping “rak” or “chak”. Description: 16·5–17 cm; 18–34 g. Dark rich brown babbler with chestnut crown and black throat; elongate plumes of lower back and rump usually unapparent. Voice: Song a repeated, rather low, long, liquid “puh puh-puh-puh” or slower “wuh wu-hu”.